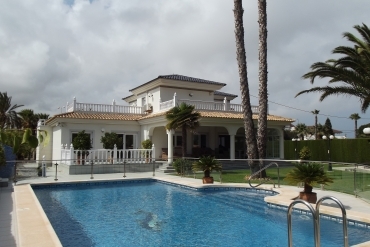 Buy a Resale Villa in Cabo Roig, Costa Blanca. The team of Casas Espania is composed by professionals with a wide experience (more than 50 years) in the real estate sector, as well as in the areas of Costa Blanca and Costa Cálida. Our philosophy is based in offering always to our clients the best service, with a great attention to detail and considering them as a part of our family. We always look for the satisfaction of our clients, taking care of any aspect that they could need. Remember that at Casas Espania there are no problems, only solutions. Following our philosophy, we want to inform you by this article about our selection of resale villas in Cabo Roig (Costa Blanca). If you are thinking about buy a magnificent resale villa at the very best price in the Costa Blanca, this post is for you. Cabo Roig is an interesting area of Orihuela Costa, with a calm and nice environment. If you are looking for a place where enjoy of The Mediterranean Sea in a calm place, but having of all kind of services, Cabo Roig is the best town where buy a resale villa. 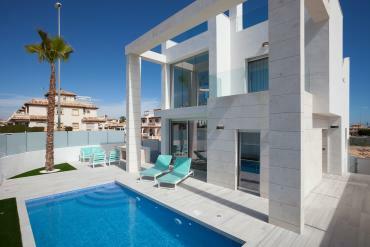 By our directory of properties you will find currently five resale villas and two townhouses in Cabo Roig. Most of them have great characteristics and extras as private swimming pool, off-road parking, air conditioning or garden. Additionally, the number of rooms and sizes is very varied, so it will be easy for you to choose the right resale villa where enjoy of the sun in Cabo Roig. 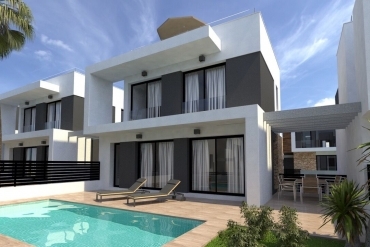 In short, if you want to buy a magnificent resale villa in Cabo Roig (Costa Blanca), do not hesitate to contact us and we will provide you the best professional and personalized help.